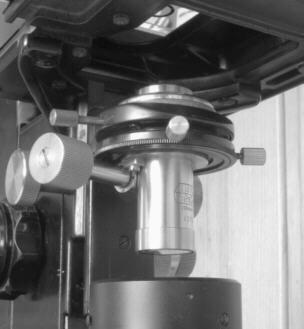 One of the more subtle of advantages of microscope manufacturers adhering to instrument standards such as the objective thread, eyepiece and condenser sizes etc., is that a pairing of parts between different manufacturers can sometimes have their distinct advantages. However, whilst most 22mm oculars are interchangeable between stands from different manufacturers other items such as condensers do not necessarily fit into the under stage profile of an alien stand, though their collar diameters may be identical. 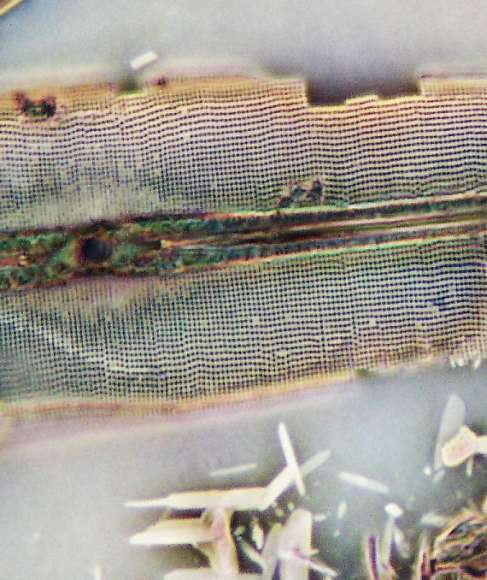 This unofficial practice has been quietly going on for years in the amateur microscope fraternity, principally to improve the quality or convenience of observation or indeed to create a working 'scope from an assembly of parts when money was in short supply. Without the shared microscope standards of course this would not be feasible. Though I was for a long time very much aware of the merits of both the Leitz Heine condenser and the Wild M20 binocular stand with its quality optics, I hadn't considered a partnership between them until I realised that my Heine's 47mm dovetail fitment masked its original 40mm collar beneath. Within a short time of realising this, I removed the dovetail and had the Heine fitted below the M20 where it has earned its rightful place there ever since. Fortuitously, the physical characteristics of both the M20's under stage profile and the Heine allow intimate close coupling, so raising the condenser to its full working height is not inhibited in any way despite the M20's bulkier understage. 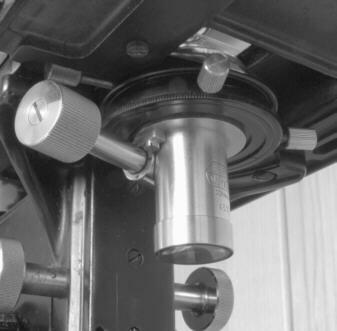 The only imperfect situation that arose was that the knurled control knob of the Heine condenser and its 2 centering screws needed a little juxtapositioning so each could be freely operated, though for some the air space around the important elevation control of the Heine when in its working position might be slightly less than ideal. Note the upper and lower settings shown below the M20's substage, allowing enough space both for adding and removing the oil immersion lens, and having reasonable finger room around the controls when in its working position. For me the other significant virtue of this coupling between Wild and Leitz was the veritable icing on the cake, for the Heine of course has its own inbuilt user centering facility: the lack of which is the cause of potential frustration when using the M20 with any condenser without a self centering mount. In effect therefore my M20 stand now has, in my humble opinion, not only the best substage optic that I could wish for, but one that has user centering capability too. This together with the magnetically held field lens which is laterally adjustable on the M20 makes for a perfect substage assembly. * A word of caution: Removing the Heine from the M20's substage condenser's retaining ring can lead to a sudden impact between the bottom end of the Heine and the M20's field lens. I found that nipping the lower end of the Heine between finger and thumb eased the optic out with better control so reducing its sudden exit from the condenser retaining ring. Placing a soft cover over the field lens completely defuses this potential hazard. With Wild's lower power x3 and x6 Plan Fluorites a little help from the finely frosted diffusion screen raised sufficiently bright fields and coverage too, whilst still providing sufficient contrast for most subjects in this amplification range. Medium to high power dry objectives are well served by the Heine, and in immersion contact with underslide, the band of angular cone range above 1.0na is generated by a different optical train in its interior, providing a much broader and brighter annulus for the high aperture oil immersion objective. The same cone setting is also responsible for the sub 1.0 na views in darkfield. Leitz's Heine condenser is without doubt a very effective substage optic. Its real virtue, that of fusing clever conception and design with excellent intrinsic quality and simplicity puts it into a class of its own. I would even venture to say that it's intended design purpose of raising phase contrast is subordinated by the image enhancing effects of its infinitely variable annulus viz in COL. It is in fact perfectly capable of illuminating the specimen with an accurately contrived, centerable annular cone of light right up to a full 1.4 na, smoothly and rapidly so, raising either Phase Contrast, Darkfield or COL with any phase objective, which is no mean feat, as it can from any standard brightfield objective minus the phase contrast of course. Illuminating the very best apochromats up to the max of 1.4 na is well within its capabilities yielding glare free imagery of the highest quality. For maximum effect the Heine needs accurate centering within an already accurately collimated 'scope. With the M20 this can be accomplished by first removing the field lens and of course the Heine before aligning the optics. When all the glassware is truly lined up the Heine can then be returned and centred and then field lens returned too, where it can function in its Kohler role as well as enabling slight corrections of parcentricity between one objective and another. Another virtue of this coupling between the Heine and M20 is that subtle off axis effects can be induced simply by slight axial movement of the field lens, which is a better option than off setting the condenser itself. Also the Heine occasionally benefits from the closing down of the field iris. The effects thus raised vary from one objective to another and can be very useful. In all, the Heine's range of lighting varies considerably but also with more subtle of adjustments that can bring about effective, albeit minute changes to the image. It does however take some time to realise its true imaging potential either in dry or immersion mode. I don't think there is such an effective substage optic anywhere to compare with it. Because of its dimunitive size and apparent lack of exterior sophistication, a novice could all too easily be seduced into believing that it is just too simple a device to merit serious consideration. Years of undoing condensor top lenses, or swapping one condenser for another in mid observation etc. thoroughly prepares the mind and soul into fully realising the true merits of the little Heine, which does what it does extremely effectively and uniquely so. Its ruthless capability of sussing out the poorer quality objectives can be an advantage or not, as by expanding its annulus to the extremes of your objective's aperture will reveal any short comings. It is at around this peripheral zone that the finest image making process occurs, so the newcomer to the Heine should be prepared for a revelation or two. and therefore very near the transition to darkfield mode. For those experienced enough in the art of microscopy who have used the Heine know only too well of its true status in the substage league. As such its intrinsic value today is relatively high, but comparatively much less so than the original asking price when newly manufactured all those years ago. Published in the September 2009 edition of Micscape.